To improve reach to consumers, several large enterprises are anticipated to adopt SaaS solutions throughout the forecast period. The uptake of newer applications, which means replacement of on-premise software with SaaS solutions is also anticipated to support market growth. The small and medium-sized businesses are also expected to follow suit as these units will look at reducing their capital investments and simplifying their operations. The rising need for outsourcing, increasing globalization, and expansion of business are all making a generous contribution toward the soaring revenue of the global market. On the negative side, issues pertaining to poor interoperability and data security are likely to hamper the growth of the SaaS market. The complications related to direct access to data in transformation legacy on-premise systems to cloud applications is also presenting tough challenges to the global market. Nevertheless, rising number of established networks and infrastructures are creating lucrative growth opportunities for key players over the forecast period. Thanks to these factors, the software as a service (SaaS) market is expected to expand with impressive CAGR of 27.90% over the forecast period from 2015 to 2022 to reach up to the value of US$164.3 bn by the end of 2022 rising from US$23.8 bn in 2014, TMR observes. On the basis of application, the global SaaS market is categorized into customer relationship management (CRM), human capital management (HCM), enterprise resource planning (ERP), operations and manufacturing, content management systems, supply chain management, and various other applications such as structured data management, system or network management, and security management. CRM is registering the strongest demand for SaaS solutions. In 2014, the segment’s contribution to the overall revenue generated in this market was US$6.05 bn. 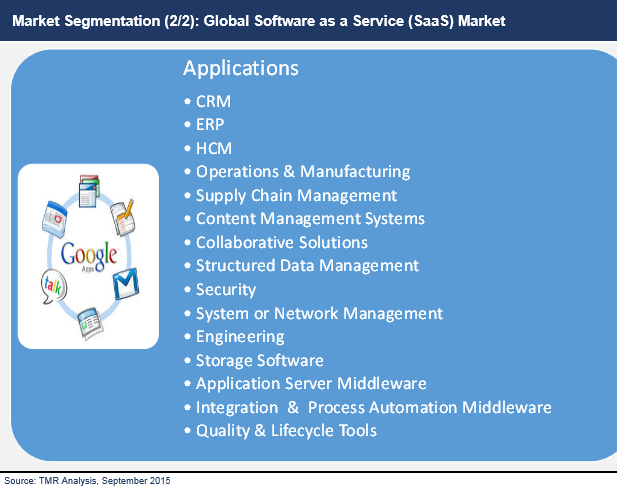 The demand for SaaS is projected to remain high in this application area over the next few years. However, the ERP and the collaborative solutions segments will emerge as close competitors to this segment by 2022. The increasing trend of e-commerce, the infrastructural development, and the rising customer support services are likely to augment the usage of SaaS solutions in these areas. HCM is anticipated to register the fastest growth in the demand for SaaS solutions at a CAGR of 32.90% during the period between 2015 and 2022. The increasing need for smart and talented workforce in organizations across the world is projected to create demand for SaaS solutions in this segment. 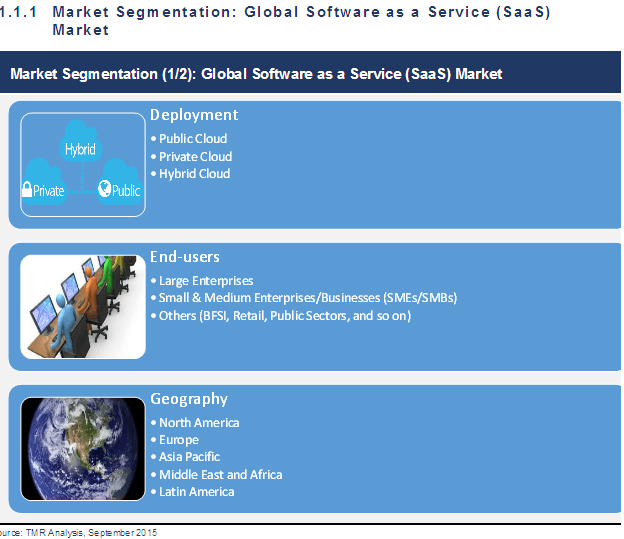 On the basis of region, the global software as a service (SaaS) market is segmented into North America, Europe, Asia Pacific, Latin America, and Middle East and Africa. Of these, North America led the market with a share of around 54% in 2014, generating US$12.9 bn in terms of revenue. Driven by the soaring demand for SaaS, due to the growing utilization of collaborative solutions, especially web conferencing technology, the region is projected to remain leading in the coming years. However, Asia Pacific is expected to present the most promising opportunities for market growth in the near future with demand fueled by the rising number of established networks and infrastructures. The region is likely to experience the fastest adoption of SaaS at a CAGR of 32.1% during the period from 2015 to 2022. Other regions are also expected to witness significant growth in the demand for SaaS solutions over the next few years. Salesforce.com Inc., Oracle Corp., and ADP Inc. are the leading vendors of SaaS solutions across the world. Some of the other prominent players operating in the SaaS market are Microsoft Corp., Amazon Web Services Inc., SAP SE, IBM Corp., and Google Inc. The “Software as a Service (SaaS) Market” report provides the analysis of the global SaaS market for the period 2013 – 2022, where in period from 2015 to 2022 is market forecast and 2014 is considered as the base year. The report precisely covers all the major trends and technologies playing a major role in the SaaS market growth in the next few years. It also highlights various drivers, restraints and opportunities expected to influence the market growth during the period of forecast. The study provides the holistic perspective on the SaaS market growth, throughout the above forecast period in terms of revenue (in US$ Bn), across different geographies, which includes Asia Pacific (APAC), Latin America (LATAM), North America, Europe, and Middle East & Africa (MEA). The report provides in-depth analysis of the SaaS market which is the most matured cloud computing technology as against Platform as a Service (PaaS) and Infrastructure as a Service (IaaS). SaaS adoption is rising tremendously as the enterprises are continuously looking forward to the third-parties for managing their software applications. SaaS is acting as one of the most prominent * as-a-service cloud segments which is enabling huge opportunities for the cloud service providers to help organizations expand or build their businesses. Furthermore, the report provides an overview of strategies and the winning imperatives of the key players in the Software as a Service (SaaS) market and analyzes their behavior in the prevailing market dynamics. The report segments the global Software as a Service (SaaS) market, on the basis of type of cloud deployment through which it is delivered to the user. These cloud deployments are - public cloud, private cloud, and hybrid cloud. Furthermore, the global Software as a Service (SaaS) market is segmented by various applications such as customer relationship management (CRM), enterprise resource planning (ERP), human capital management (HCM), operations and manufacturing, supply chain management, and so on. Moreover, considering the potential user of these services, the market is further divided into various end-users across in terms of enterprise size. 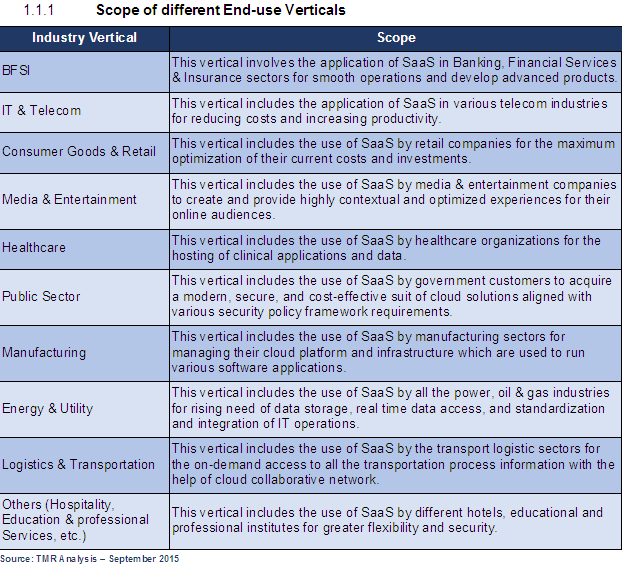 By various end-users, the global SaaS market is segmented into large enterprises, SMBEs/SMBs, and others, which includes BFSI, retail and public sectors. Thus, the report provides in-depth cross segment analysis for the SaaS market and classifies it into various levels, thereby providing valuable insights on macro as well as micro level. The report also provides the competitive landscape for the SaaS market, thereby positioning all the major players according to their geographic presence, market attractiveness and recent key developments. Based on this, these companies have been positioned in different quadrants as market leaders, emerging players, promising players and niche players. The whole SaaS market estimates are the result of our in-depth secondary research, primary interviews and in-house expert panel reviews. These market estimates have been analyzed by taking into account the impact of different political, social, economic, technological, and legal factors along with the current market dynamics affecting the SaaS market growth. Salesforce.com, Inc., Workday, Inc., Automatic Data Processing, Inc., Amazon Web Services, Inc., Microsoft Corporation, Fujitsu Ltd., Oracle Corporation, IBM Corporation, Google, Inc., are a few major players operating within the global Software as a Service (SaaS) market, which have been profiled in this study. Details such as financials, business strategies, recent developments, and other such strategic information pertaining to these players has been duly provided as part of company profiling. *Note: The market size estimates (values in US$ Bn) mentioned in the report may not add up to the total value due to rounding off.